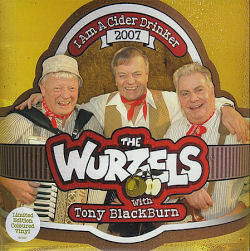 The Wurzels released an updated up-tempo version of their 1976 hit I Am A Cider Drinker featuring guest vocalist Tony Blackburn. 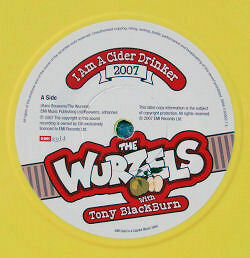 The radio legend was the perfect choice to team up with the band, having originally introduced their performance on BBC TV's Top Of The Pops on Thursday 23rd September 1976 when the original release of I Am A Cider Drinker reached #3 in the charts! The single also has a serious side - in 2006 Tommy Banner was diagnosed with prostate cancer after going for a random test. After an operation and radiotherapy, he was back to fighting fitness but is obviously keen to highlight the importance of testing. 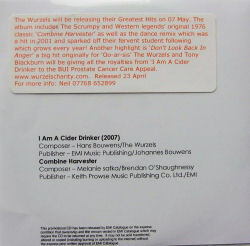 The Wurzels and Tony Blackburn will be giving all the royalties from the single to the BUI Prostate Cancer Care Appeal. You can watch the video on YouTube. It's full of milkmaids, cows and, of course, a whole load of cider! 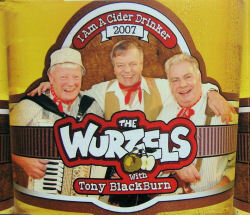 The band line-up is not credited on the sleeve, but one would presume that it is Tony Blackburn (vocals), Tommy Banner (accordion, vocals), Pete Budd (banjo, lead vocals) with possibly John Morgan (drums) and maybe Sedge Moore (bass). In saying that neither John or Sedge appear in the video (the drummer is a cow! 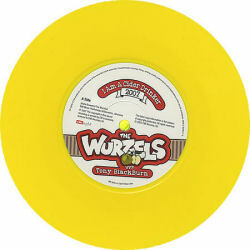 ), so there is no evidence to suggest they were a part of the recording process either. At a educated guess, Louie Nicastro was probably the producer and sound engineer, and provided the remaining instrumentation. 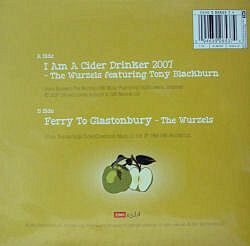 I Am A Cider Drinker 07 was released on CD, download and and as a limited edition 7" single on coloured vinyl. The limited edition 7" vinyl single pressed on yellow-coloured vinyl with a picture sleeve (both pictured below), and this contains the 2005 Ferry To Glastonbury on the reverse. 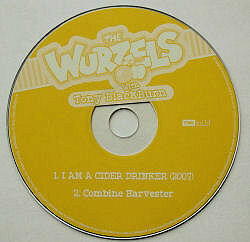 EMI Gold also released a two-track CD-R demo single (pictured at bottom of the page), issued exclusively to radio stations and reviewers. 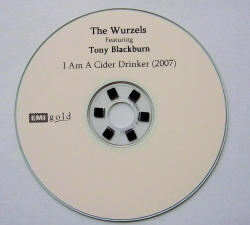 This had a custom printed disc, title inlay and press release.